The photos first caught my attention, then the title of the article. The pictures were of a Black man, one from years ago and the other present day. 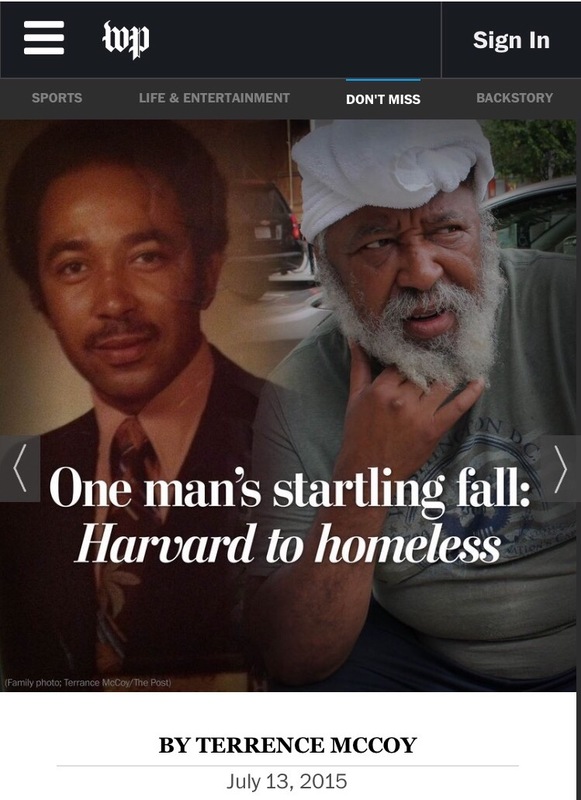 The title: The homeless man who went to Harvard with John Roberts. I’ll admit seeing a Black face in a major news publication makes me stop my endless scrolling, but seeing this man went to Harvard, probably before I was born, was definitely worth a click and a few minutes of reading. I wasn’t prepared to discover the reason for his downfall. Not to give away the entire story (because I want you to read it too), but Alfred Postell was diagnosed with a mental illness. Even though Mr. Postell was VERY accomplished at the time of his first “break”, he still ended up homeless. Maybe it is the optimist in me, but I’d like to think if Mr. Postell and those around him at the time had more information on his illness and more resources available he may not be homeless. I share this story and ask you to read it because any of us could be the next Alfred Postell or we may know him (or her). I hope this story will show how important it is to, at least, be aware of mental illnesses, and the importance of paying attention to our mental health, as well as our loved ones mental health. I want people to notice that Mr. Postell is not violent. This is important point out because the media tends to only cover stories about mental illness when violence is involved. Finally, I believe that this story will provide hope; hope to those suffering from any mental illness that you can get support, and people will want to help you. While Mr. Postell is homeless, the story describes how a local pastor took him in when his mother could no longer care for him. I know many of us have so much going on in our lives, however ,I ask that you take the time to read about mental illness and mental health whenever possible, encourage others to do the same, and TALK ABOUT IT. Together we can speak away the stigma that surrounds mental illness. Click here to read the story written by Terrence McCoy for the Washington Post. Previous Previous post: Black. Female. Bipolar Disorder.